Cryptozoic Entertainment drops a DC Comics collecting bombshell for the third time with 2019 Cryptozoic DC Bombshells Series 3 (Series III) trading cards. Based on Ant Lucia's pin-up style featuring superheroines from the World War II-era, each box of the 1940s-themed release includes one sketch card and one vinyl figure. 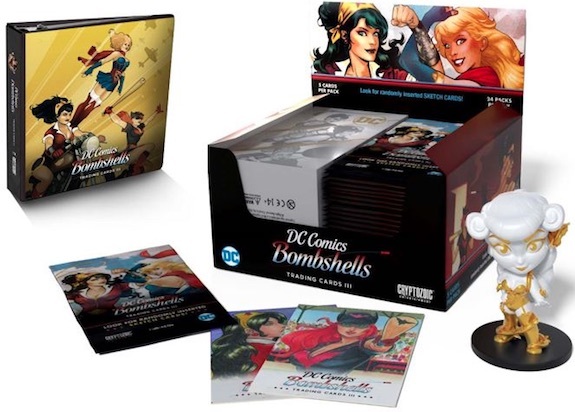 The 60-card base set in 2019 Cryptozoic DC Bombshells Series 3 uses the artwork from hand-drawn sketches found in Series 1 (2017) and Series 2 (2018). Giving set collectors a bit more to work with, there are four chase inserts available, including Gotham's Greatest, On the Front Line, Show-Stopppers and Wonder Girls. In addition, Foil parallels add an extra element to the base and insert sets. Fans can also keep the set in order with the full-color binder that displays artwork from the DC Comics comic book line. Each binder has an exclusive card. Coming 1:24 packs, or one per box, the Sketch cards are one-of-one editions from various artists. The final option in each box of 2019 Cryptozoic DC Bombshells Series 3 is the vinyl figure, also at a rate of one per box. The Golden Goddess DC Lil Bombshells figures can even be found in a hand-painted version (1/1).